The skin around your eyes is one of the first areas on your face to show signs of aging. Rubbing your eyes can break tiny blood vessels under the skin’s surface and cause dark circles and puffy eyes, as well as premature crow’s feet and drooping eyelids. Botox injections and cosmetic eyelid surgery can rejuvenate the eye area, but prevention is best: refrain from pulling and tugging at the skin around your eyes. Exposing your eyes to the sun’s harmful UV and high-energy visible (HEV) rays is a surefire way to prematurely age and damage your eyes and eyelids. Extended sun exposure leads to: sunburn of the front surface of the eye (photokeratitis); cataracts; macular degeneration; pinguecula and pterygium (unsightly growths on the eye); and even cancer of the eyelid. Wear sunglasses that block 100 percent of UV rays and the most damaging HEV rays — even on overcast days! Smoking harms just about every organ in your body — including your eyes. Research has linked cigarette smoking to sight-threatening eye diseases such as cataracts, macular degeneration, uveitis, dry eyes and diabetic retinopathy. In fact, smokers are up to four times more likely to go blind, compared with non-smokers. The good news is that quitting smoking, no matter what your age, can reduce your risk of developing a serious eye condition. Eating too much fast food and not enough fruits and vegetables? Then you’re probably not getting the necessary vitamins, minerals and essential fatty acids for optimum eye health. Leafy greens, colorful fruit and vegetables, and wild-caught fish such as salmon can help prevent or manage many age-related eye diseases. Eye vitamins can fill in nutritional gaps, but a healthful diet, daily exercise and watching your waistline are more effective ways to keep your eyes in top shape. 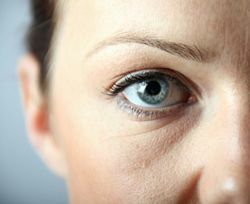 It’s called beauty sleep for a reason: not enough sleep can accelerate aging, and your eyes may be the first to suffer! Lack of sleep causes red, bloodshot eyes, dark circles under the eyes, eye twitching, dry eyes and blurry vision. Not getting the recommended eight glasses of water a day and eating a high-sodium diet can cause your body to dehydrate and in turn not produce enough tears to keep your eyes moist and properly nourished. Eye-related symptoms of dehydration include dryness, redness and puffy eyelids. Regular eye exams can detect vision problems, eye diseases and general health problems before you’re aware problems exist. Sight-threatening diseases such as glaucoma often have no warning signs until there is a permanent, irreversible loss of vision. Inform your eye doctor of your family’s eye health history to help determine if you have a high risk for a particular eye disease or condition. Call Good Looks Eyewear today to schedule an eye exam. For many people, the notion of being able to get an eyeglass prescription and buy glasses without a trip to the eye doctor sounds appealing. But is this really a good idea? Here’s what you need to know about online eye exams and vision tests before thinking about saying goodbye to your eye doctor. 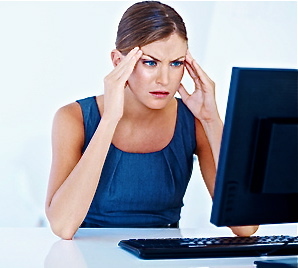 Online Eye Exams can be very frustrating and inaccurate. First of all, it’s important to understand that an online eye test — even if it’s called an “online eye exam” — does not evaluate the health of your eyes. Usually, an online eye test (more accurately, an “online vision test”) only measures your visual acuity and refractive error. In some cases, other vision tests, such as contrast sensitivity and color blindness, are included. But these measurements tell you little or nothing about the health of your eyes and whether you have conditions such as cataracts, glaucoma or macular degeneration. Even if you choose to try an online vision test, be aware that you should still have routine eye exams as frequently as your eye doctor recommends. A comprehensive eye exam is the only way to insure your eyes are healthy and free from sight-threatening conditions. More research is needed to guarantee that the accuracy of an eyeglass or contact lens prescription generated by an online vision test is comparable to a prescription determined in person by your eye doctor. Our doctors at Scott and Christie take the time for each patient to make sure that the results of the eye exams are accurate. We strive to make sure our patients feel comfortable and safe at all of our locations. Call today to schedule an appointment with our doctors at Scott and Christie Eyecare associates and Good Looks Eyewear.